As the snow fell over Caledon my typist found herself shivering in front of her computer screen and hurriedly wrapped me up in a scarf and gloves. It’s odd, those real life feelings that occur when hunched over the keyboard. What a moment it must have been, for those earliest residents of sl, in mid-2004, when the first hug was invented by Francis Chang. 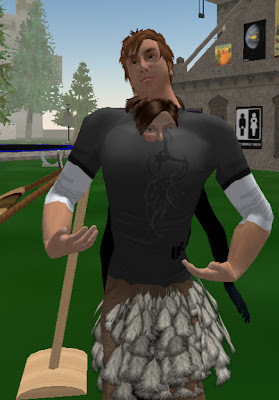 When an avatar is “born” they’re given default clothes, shapes and gestures. This means you end up trotting across the landscape with your fingers splayed like you’re running over hot sand – ‘ouch, ouch, ouch’. Eager to rid myself of the “awkward newbie walk” I made my own animation override (how to here: http://www.instructables.com/id/How-to-add-animations-to-your-Animation-Override-i/). Now I walk tall, shaking my tail feather elegantly and, when standing, I cross my arms, or puts my hand on a hip, and look intently and coolly at whatever’s in front of me. My first hug came from my neighbor. He introduced himself – doing a few cat back flips (he’s a neko) and we had a lovely chat. Before he left a dialogue box popped up - “Permission to hug Siri” it asked. I timidly typed “yes” and suddenly I moved gently into the arms of my neighbor who gave me a kindly, head in the armpit hug. I, and my typist, felt warmly welcomed into Second Life.